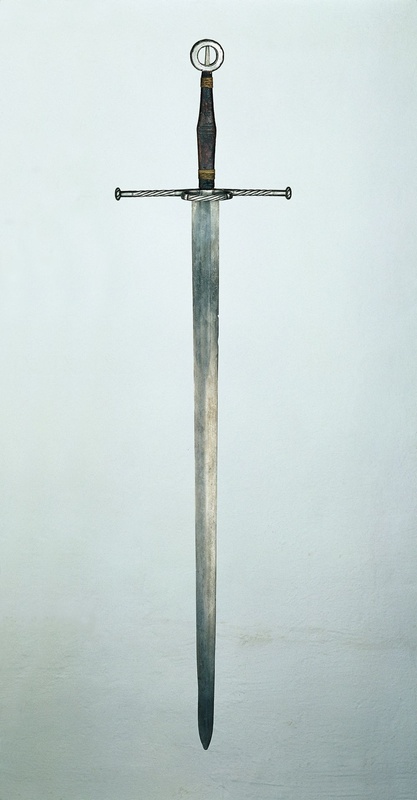 Forum Index > Historical Arms Talk > Irish Sword in German Museum? Posted: Sun 23 Oct, 2016 3:55 am Post subject: Irish Sword in German Museum? Does anyone here have more information on this sword? It seems to be a previously unidentified Irish ring pommelled sword in a German museum. Hopefully it's not a fake. Interesting find! But comparing it to other ring pommeled swords I've seen it looks more as if someone took an irish ring pommel and put it on a non-irish sword. The hilt design looks just too out of place for me. Thats exactly what I'm afraid of. According to the descriptions, the maker's mark indicated that this is an Italian blade. This prob. does not help much but MRL had an "Irish two-hander" a few years back that looked very similar to that sword minus the side rings. I have that Irish two-hander from MRL. The museum piece is indeed a quandary. Wonder if it's a Victorian composite sword? Did the Irish use Italian blades during the 15th - 16th centuries? I'm sure I have read they used a lot of German manufactured blades. the description says "probably italian"
but the descriptions seem very odd. so it might well be, that said sword really is irish, maybe it came to germany in the course of the 30-years-war, if i might speculate a bit. irish mercenaries were not so uncommon. I have that too and they are indeed similar. Its based on the cover art of a modern book, which in turn was based on an historically contemporary etching (which is reproduced in another book on the gallowglass). The well-known names of both authors and the original artist escape me right now but I can look them up if nobody else remembers. I don't think it would be surprising if an Irish cutler received an Italian or German sword, refit it with a local style pommel for sale, and then it ended up back on the continent for some reason. As Oakeshott said, swords travel and have a life of their own. Angus McBride . I have the Osprey book..Celtic warriors I think is the title. It was a pretty awesome Windlass... I owned it but sold it several years back when I got back in to collecting swords,in a big way. I miss that sword...quite a nice piece. All Irish sword blades from this period would have been imported from the continent, but usually they were hilted locally. What's odd about this piece is that the pommel is a distinctive type, which so far has not been found outside of Ireland, but the crossguard is typical continental style. Posted: Wed 26 Oct, 2016 3:24 pm Post subject: Re: Irish Sword in German Museum? That an Irish sword would end up in a German museum is not really that surprising. Irish soldiers served as mercenaries in German armies as well as Scots and even Englishmen throughout the Middle Age and Renaissance. Posted: Wed 26 Oct, 2016 4:26 pm Post subject: Re: Irish Sword in German Museum? It's not the fact that an Irish sword would wind up in a continental museum, It's the combination of pommel and guard that I find questionable. The second is in Vienna, number A451. The blade is marked with the (spurious) date 1530 and it was apparently at one time reputed to have belonged to the emperor Charles V, but the blade also bears the mark of Johannes Wundes from Solingen, working around 1600. Thanks for sharing those images Mark. I had not seen them before. My first thought was that the sword I posted had the look of a composite piece, and as its unprovenanced, we likely will never know the story behind it. The "Danish" sword is from the E.A. Christensen collection and in "Gammelt Jern" by Ada Bruhn Hoffmeyer (1968) we learn that he acquired it at the auction of the collection of Richard Dreger in Luzern (Lucerne), Switzerland, August 1927, catalog number 65. It says that in Dreger's catalog the sword was described as Italian (? ), though no mention why that was believed. Perhaps it is based on the description of two inlaid brass figures on one side of the sword blade, which sadly is not explored in further detail and neither do we get an image of them in Hoffmeyer's book. Apparently the sword was tested by "Søværnets Prøveanstalt" (Testing facility of the Danish Navy) the 17th of June in 1935. It was constructed of slag-filled "smedejern" (low carbon "wrought iron" !) with no valsning (rolling) of the metal. Must ring pommels always be Irish? I'm willing to bet that the examples shown on this page are more likely to be one-off instances of highly unusual swords made on the Continent. There might have been some awareness of irish ring pommels involved but it's really hard to believe that nobody on the Continent could have just thought of making something weird and ended up with ring pommels that looked like Irish ones by pure coincidence.